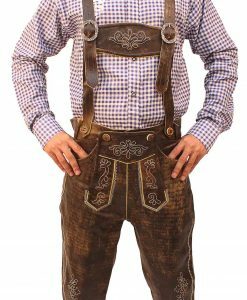 A must-have for the world’s most awaited and popular folk festival, a German lederhosen unfailingly steals the limelight. 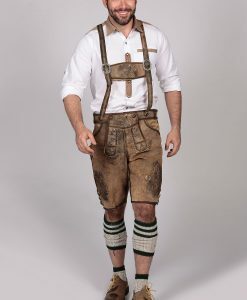 The original trachten fashion for men not only looks great on native Bavarian’s but also on all those guys who wish to remain in vogue when holding and indulging in pints of German beer. 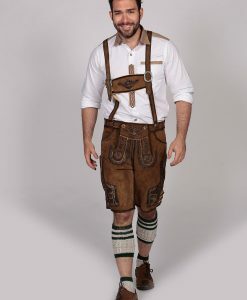 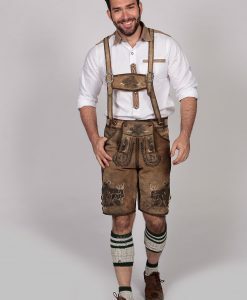 Regardless of the size of the occasion, all those who love booze and wish to dance at Oktoberfest need to look stylish as they dress properly. 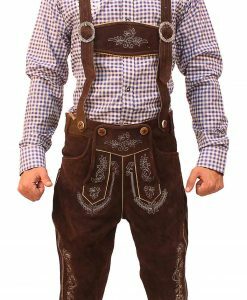 Lederhosen Store is pleased to offer an impressive collection of men’s German lederhosen at the best prices. 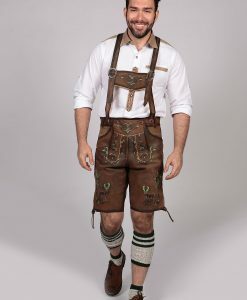 We have Bavarian outfits for men, manufactured keeping the authentic German tracht tradition in mind. 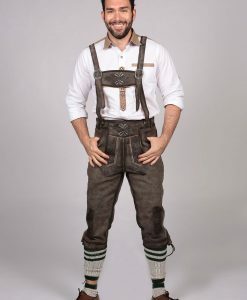 We use the highest quality materials to design and produce our own unique styles for men’s lederhosen. 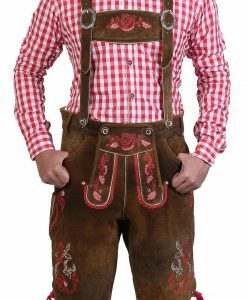 Rest assured that we bring only the highest quality, authentic, and comfortable fitting outfits that will enhance the style quotient of every fellow, making a lasting impression on all those pretty beer girls you see at Oktoberfest! 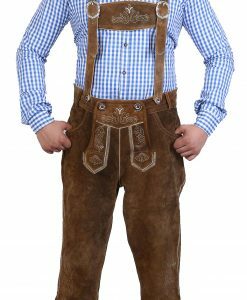 We offer an unlimited and impressive assortment of German lederhosen, which features leather pants, checkered lederhosen shirts, leather suspenders, shoes, accessories and everything you need to complete your authentic German look. 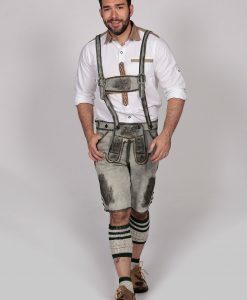 Hotter or summer days, short or knee-length lederhosen also remains a popular choice among men, and you are sure to find a wide range of German Bundhosen for men at our Lederhosen Store. 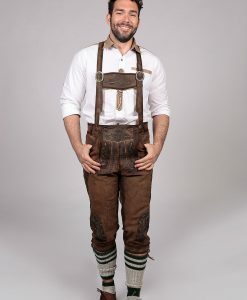 The authentic tracht for men available here are fused with trends and unique styles, so when exploring our collection, get ready to find something unique that suits your style and fashion! 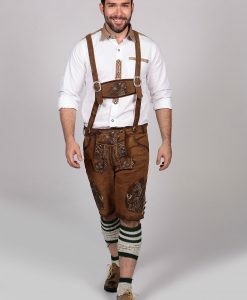 Take your time and choose from age-old earth colors, including golden brown, dark brown, medium brown, black, green, caramel, light brown, and so many other unique shades. 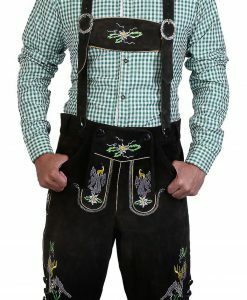 You can also choose from traditional style two-tone color variations. 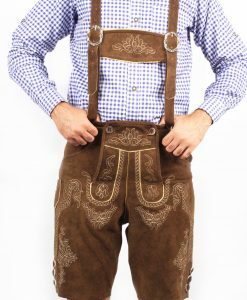 Go for lederhosen for men that feature embroideries on the pants, depicting the rich culture of Bavaria, its beliefs, and traditions. 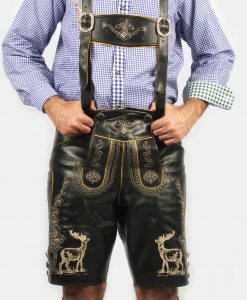 Each German lederhosen you find here features intricate details in embroidery. 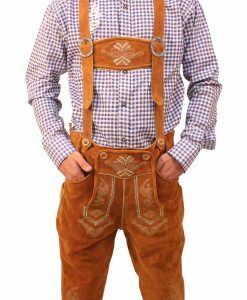 You can find two-color tone embroidery variations, styled with buckhorn buttons, buckles, and fully embroidered H- suspenders to add more to the authentic German look. 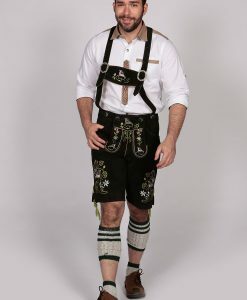 Each lederhosen features delicate embroidered details that are intricate and exquisite. 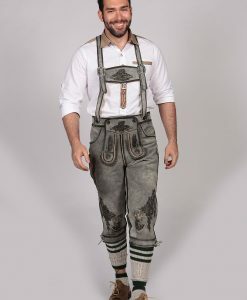 Some feature two-tone embroidered variations styled with buckhorn style buttons, fully embroidered H-suspenders, and more to complete your authentic Bavarian look. 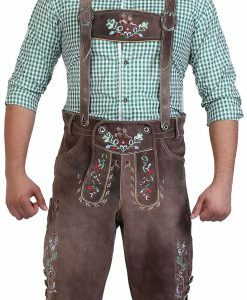 Throw in a checkered shirt with your lederhosen pants, available in different colors at our store, including the top sellers green, blue, and red. 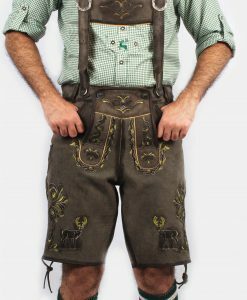 To complete your German look, don’t forget to put on your lederhosen shoes, socks, and hat! 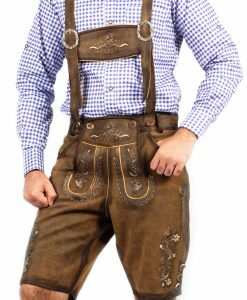 Buy German Lederhosen for Men Now! 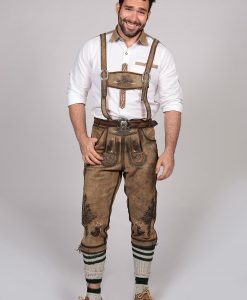 Our selection of German lederhosen for men is not just the ideal wear for men attending Oktoberfest in Munich, but also perfect for men attending Oktoberfest celebrations in any corner of the globe. 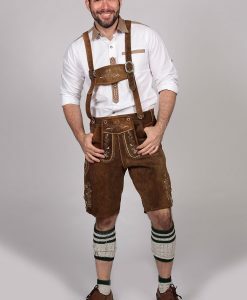 From Munich, all the way to the United States, wearing this costume is a macho fashion statement, a dedication to the honored Bavarian traditions, and culture! 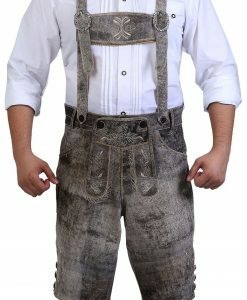 So what are you waiting for, load your online shopping carts now with the best quality German Lederhosen now!